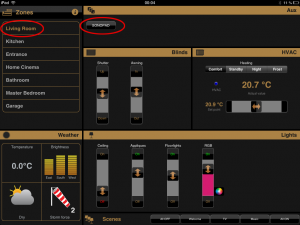 SonoPad 1.4.0 comes with Improved Home Automation Integration. Those of you doing home automation, typically use a different App as their main remote control App. Typical examples are CommandFusion , iRule, iRemoteControl for simple tasks or more advanced Apps like KNX ProServ. These tools often allow you to start a different App with a short URL, so you are able to directly start SonoPad (or in the meantime even the official Sonos App) from them. at some point you want to get back to your Home Automation App. Pressing the home button of your iPad and selecting the App on the iPads main screen is inconvenient. Enough talk – show me examples! Ok, ok – Here is an example from the KNX ProServ App (this is an App to control your whole home, based on the KNX bus), to show you what is possible. What you can see here, will work in other Apps as well (see instructions below). 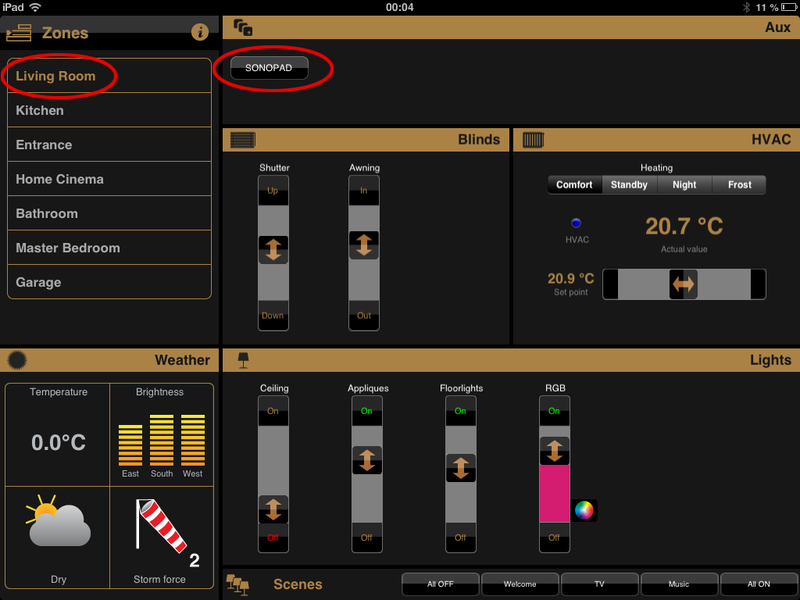 As you can see, this App is configured to control the whole room (blinds, temperature, …), but also contains a link to SonoPad. When you tap it, SonoPad will automatically start with the player selected in the ProServ App, so you can start controlling the music in this room right ahead. In addition SonoPad will include a small icon to directly jump back to the ProServ App. No need to go via the main menu of the iPad anymore! So how does all this magic work? returnURL=iknixhd%3A%2F%2F the URL to return to, when the user presses the icon in SonoPad. It’s URL-encoded, so actually itreadsiknixhd://If you leave out this parameter, SonoPad won’t show the icon to return to the original App. You will see a list of all players and on the right also a column UUID. If you leave out this parameter, SonoPad will revert to it’s default behaviour, i.e. on start it will select the SonoBox that was selected when you left SonoPad the last time. Hope you enjoy this new feature!